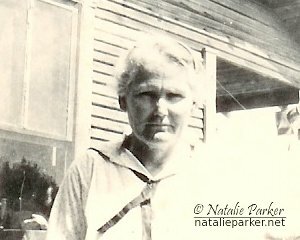 On 15 July 1913, Martha Elizabeth "Mattie" Nowell went to Comanche County Judge J. H. McMillan to apply for a Texas State Confederate widow's pension. We learn some more interesting things from this pension application packet from the Texas State Library and Archives Commission. 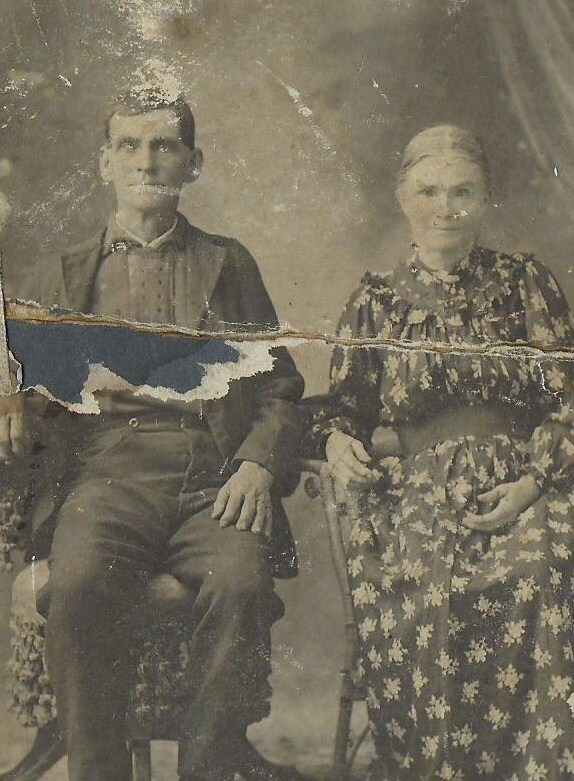 Martha indicates in her application that her husband died ten days prior on 5 July 1913, in Comanche County, Texas, and that they were married on 7 Feb 1867 in Winston County, Mississippi. Also that she is 69 years old, was born in Winston County, Mississippi, and has resided in Texas for about 45 years. She has lived in Comanche County for about 35 years, and her post office address is Comanche, Texas RFD 4. At the time of submitting the application she didn't know Joseph B. Nowell's regiment during the war, but that wasn't a problem because he already had an accepted pension on file to refer them to. However, she did have to find two witnesses to verify that she was indeed the widow of J. B. Nowell, had not remarried in the ten days since he died, and had lived in Texas continuously since at least March 1, 1880. J. E. Brown and M. L. Brown vouched for her on that. Now, J. E. Brown may well be Martha's son-in-law, Joel E. Brown, who married daughter Emily Elvira "Varie" Nowell, and lived nearby in Comanche County. I have no idea who M. L. Brown is, but likely one of Varie's in-laws. The State and County Assessor, M. E. Hall, also had to submit a certificate indicating the assessed value of any land and personal property associated with Martha Nowell, which was, in fact, "Nothing". So all of this information was submitted in Martha's pension application to George W. Kyser, Commissioner of Pensions. It was filed July 31st, approved September 1st, and "allowed from" December 1st, 1913. But also on file with Martha's pension application is an Application for Mortuary Warrant submitted by her son-in-law, John S. Davis on April 1, 1926. Sometime after J. B. 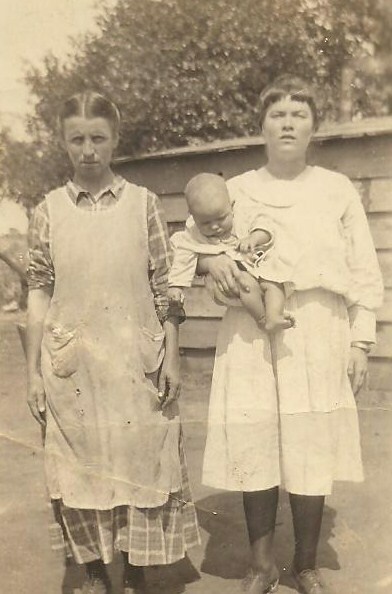 's death, Martha went to live with daughter Bettie Frances (Nowell) Davis' family in Henderson County, Texas. She appears in their household on the 1920 census. Mortuary Warrants, when approved, helped pay all or part of the funeral expenses for a pensioner. While this particular application makes no mention of the requested or approved amount, another Mortuary Warrant attached to the pension file of a different ancestor who died in 1919 indicates that the State would pay up to $30 of the burial expenses. 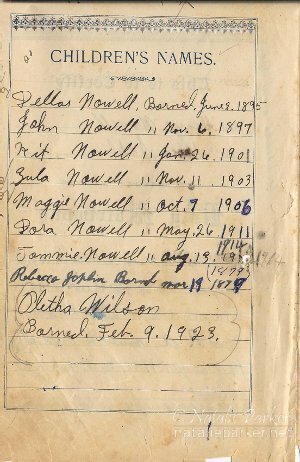 The mortuary warrant application indicates that Martha E. Nowell died on 15 March, 1926 in the home of J. S. Davis in Chandler, Henderson County, Texas. That he is her son-in-law, and his post office address is Chandler, Texas R 2. Also attached to the application is a Certificate of Undertaker and Certificate of Physician. Dr. M. M. Moss of Brownsboro, Texas, was of the opinion that Mrs M. E. Nowell's last illness was influenza. I, "We Blake Cade & Smith", do certify that I am undertaker "we deal in caskets" in the town of "Chandler" County of "Henderson", State of "Texas", that I had charge of the body of "we sold the casket for Mrs. M. E. Nowell", who died in "near" the town of "Chandler", County of "Henderson", State of "Texas" on the "15th" day of "March" 1926. That said body was prepared for burial by me "friends of deceased" on the "15th" day of "March", 1926, and that I am of the opinion that warrant herein applied for should be issued to the said "J. S. Davis" who makes the foregoing application. Now that I am thinking further ahead concerning family photos, I've decided to begin posting these photos for current and future researchers of these lines to add to their family history research. George and Rebecca had a lot of kids, a lot of grand-kids, and who knows how many great-grand-kids. Statistically, there has to be someone out there who will appreciate these. George was born 9 Apr 1875, probably in Delta County, Texas according to the death certificate of J.D. Nowell. His parents were Joseph Benton Nowell and Martha Elizabeth "Mattie" Dennis. He died in Livingston, Texas on 26 Apr 1949, and was buried in Rockhill Cemetery, in Henderson County on 27 Apr 1949. Here is a link to his findagrave.com memorial. Rebecca was born in Tennessee on 18 Mar 1879, to John Joplin and Sarah Ann Douglas (or Douglass). Her mother died when she was young, and John Joplin remarried to Lucretia "Creasy" Choate. 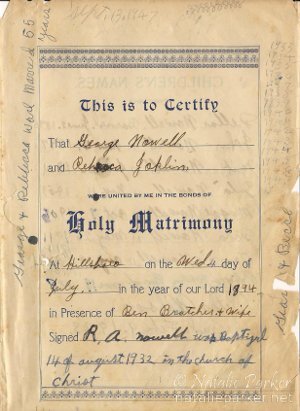 Rebecca married George Eugene Nowell on Wednesday, July 4, 1894 in Hillsboro, Hill County, Texas. She died 20 Apr 1962 in Tyler, Smith County, Texas, and was buried in Rockhill Cemetery, Brownsboro, Henderson County, Texas the following day. Here is Rebecca's findagrave.com memorial. I'm not sure whether or not I can post the newspaper clippings of their obituaries without infringing on the newspaper's copyright (if anyone knows, please comment! ), so I will check into that. Rebecca's death certificate is available at familysearch.org, but I haven't been able to locate George's yet. 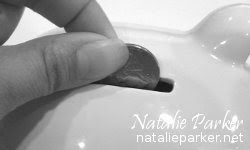 I've decided to save myself $70 a year by moving my blogs over to Blogger. It's been a bumpy ride, but I'm sure it will be worth it in the long run. The major downside is that, while I managed to keep my original domain name, all of the links to individual posts have changed. And there doesn't appear to be any way to override that. 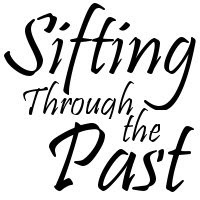 Another issue is that I lost all of the comments from the original Sifting Through the Past blog due to incompatibilities between Wordpress and Blogger. So, sorry about that to all who commented on posts. I still have the exported files if I ever figure out a way to make it work. I'm still experimenting with the gadgets to figure out what is actually useful, and which ones are just clutter. 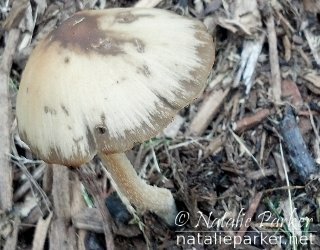 Any feedback or tips from other Blogger bloggers (redundant much?) is always appreciated. Though I haven't been posting very frequently, I am working on organizing my genealogy data. I've been toying with spreadsheets in OpenOffice for compiling data into a more user-friendly, at-a-glance type of format, but I'm still in the beginning process. Mostly I have been writing up transcripts of pension applications and relevant census data for easier referencing per individual ancestor. This is going to take quite some time if the days it took to complete for a single ancestor is any indicator. Ultimately, I'm shooting for a well-sourced timeline for each ancestor in an effort to make the events in their lives more coherent. There is a lot of troubleshooting involved as I experiment with different methods, but hopefully I will stumble upon a way to make this endeavor much more efficient. Spring Break this year fell on the perfect time to clear out an unused flower bed and fill it with new life. 2.0 and I started on it last Tuesday, loosening up the soil, yanking weeds, and spreading the wildflower and zinnia seeds she got for her birthday. Yesterday, we planted a tomato and a variety of herb plants, just as my daughter's interest in the entire project faded into oblivion. Oh well. I always lost interest a short way into my mom's gardens, too. Unfortunately, hers were of a scale that required all of us to pitch in and help, whether we liked it or not. This morning, I was plucking out some of the larger remaining weeds in preparation for applying the Texas native cedar mulch when the vivid memory of Grandma's roses came to mind. I remember being appalled as she casually pulled off what I thought was a perfectly nice yellow rose, then sprinkling the discarded petals over the floor of the flower bed as we said our good-byes. I'm sure I asked my mom about it when we got into the car, and I'm sure she gave me a perfectly good explanation. Or maybe I didn't ask. 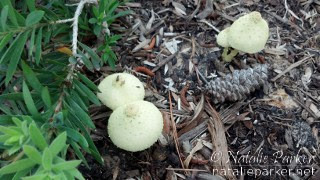 But I know now that the rose was nearly spent, and would soon drop its petals anyway, making way for nutrient-draining rose hips that are far less attractive than a new rosebud. That is, if you aren't planning on harvesting the hips from your rose bushes. 2.0 prefers to let the cycle run its course with hers. 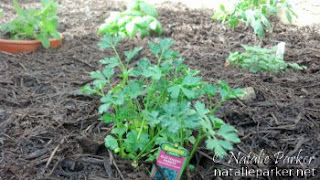 As I spread the mulch over the top soil, the smell reminded me of tilling and planting mom's vegetable gardens (I say vegetable gardens, though the majority of what we planted were technically fruits). We didn't plant one every year, but probably did so more often than not from the time I was 13. Mom loved to grow as large of a variety of produce as she could fit into our backyard, and even planted a separate patch to one side of the front yard dedicated solely to corn at least once. Absolute necessities were tomatoes, peppers, cucumbers, cantaloupe, watermelon, and peas. She had some nostalgic obsession with the act of shelling peas that neither my sister or I could fully comprehend, though we did love to joke about it. We all got to pick out anything we wanted to grow. Mom made me plant my jalapeno and cayenne peppers at the far end of the garden, away from everything else, for fear the hot peppers would somehow add "heat" to any surrounding fruits. I'm still not sure if that is even possible, but I obliged. My favorite part of the whole process was eating my freshly picked jalapeno peppers right there in the garden while harvesting the fruits of our labors. I've taken a couple of shots at vegetable gardening in the last eight years. Without Mom reminding me to go out and water the plants every evening, they generally wither within a few weeks. Today, my lone tomato plant sits nestled among the parsley, oregano, basil and mint. Six little navy beans, hundreds of zinnias, and a robust mix of wildflowers have yet to breach the surface. Their future is uncertain, but I've kept it small enough to manage until I can get the hang of this gardening business. In the 1930s, the Great Depression was further compounded by over-farming and a decade-long drought that impacted a significant portion of the United States. "Black blizzards" of dust blew from the dead wheat fields in west Kansas, the panhandles of Texas and Oklahoma, and the eastern borders of New Mexico and Colorado, darkening the skies throughout the plains. After the death of their parents in 1928 and 1929, Granddaddy's twin brother Joe was boarding at the home of Hugh C. Morman on April 5, 1930 when the U.S. census was taken there. The rented farm was located near Joe's older brother Nathan's farm, as well as Grandma's parents, George and Rebecca Nowell's farm. Joe and Hugh were both working as farmers, and were close to the same age, Joe being 28, Hugh 29. They probably went to school together. Hugh had recently started a family, and had a 3 year old daughter at the time. Joe remained single. The drought and falling prices of crops drove many American farmers into migratory work. They traveled from farm to farm seeking seasonal labor, and received nominal pay for their efforts. 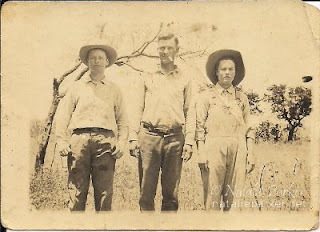 Sometime during the 1930s, Granddaddy's twin brother went west with the migratory farm workers, bound for Arizona. Rumors of large harvests ready for picking often spread along the highways of Texas during the Great Depression, but the rumors were at times fraught with errors. It wasn't unusual for migrant workers to chase down these rumors only to find there has nothing to harvest. Or too many laborers had arrived ahead of them, and there were no more jobs left. Joe Parmer was never heard from again. After failing to return home, his family and friends began to suspect the worse. There were many hazards in the life of a migrant farmer. Deplorable living conditions in the labor camps or lack of shelter on the road could lead to fatal illnesses. Labor strikes would sometimes culminate in violence. There is no way of knowing whether or not Joe reached his destination. 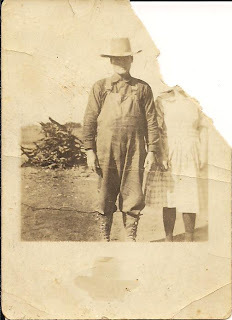 If he died on the road or in a labor camp, no one identified him as Joe Parmer of Henderson County, Texas. Else one of his brothers would surely have been contacted for burial arrangements, and there would be no mystery. While we may never know what exactly happened to Uncle Joe, Grandma maintained this theory on the disappearance of her brother-in-law: "He probably got drunk and fell in a well." Donald Worster, "DUST BOWL," Handbook of Texas Online (http://www.tshaonline.org/handbook/online/articles/ydd01), accessed February 14, 2013. Published by the Texas State Historical Association. "US Census, 1930," images, Henderson County TXGenWeb "http://www.usgwarchives.net/tx/henderson/census/1930/19-03b.gif : accessed 14 Feb 2013" Joe M. Parmer, boarder in the household of Hugh C. Mormon, Precinct 5, Henderson, Texas, citing ED 107-19, page 3B, dwelling 58, family 57, NARA microfilm publication T626, roll 2355. Email conversation with Gary Wright about Joe's disappearance. Email conversations with Gina, Nancy and Donna about Grandma. 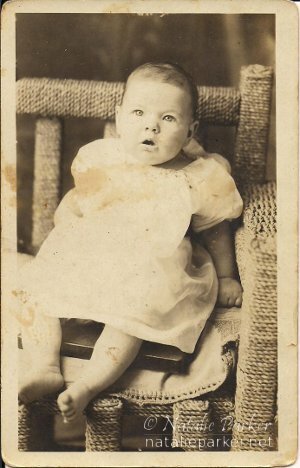 In the Spring of 1927, Grandma, Granddaddy and 1 1/2 year old Effie were living in or near Chandler, Tx (maybe Brownsboro), when they welcomed Winnie Dois Parmer into the world on March 22. The sisters were very close growing up, seemingly inseparable when you look through the family photos. While the two were very different, their personalities complimented each other well. Effie was shy and reserved, whereas Winnie was very outgoing. And it was probably because of this that Grandma allowed Effie to wait on starting school until Winnie could go with her. Now, Granddaddy enjoyed a stop at the bar when he had the chance, but he learned, perhaps the hard way, that he couldn't stop there if he had Effie with him. You see, Grandma was opposed to drinking, so Granddaddy just wouldn't tell her. But Effie would rat him out. Winnie, on the other hand, enjoyed going to the bar with her daddy. Granddaddy would set her up on the bar, and she would become the center of attention. Granddaddy didn't have to worry about Winnie telling on him. Zula's brother John Benjamin, and his wife Alice Terrell, added two more children to their growing family. 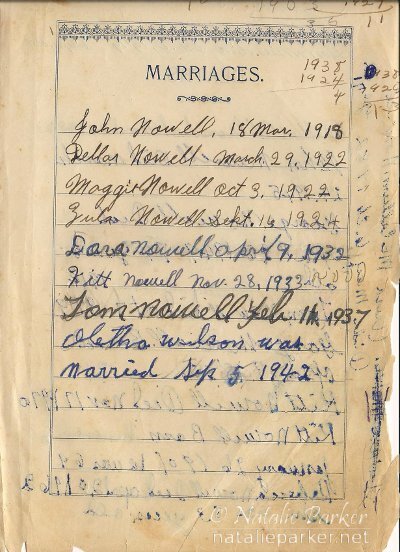 In addition to Lorene, Murry, and Juanita, John and Alice had John B. Nowell Jr. on January 1, 1926, and Margaret Virginia Nowell on 26 July, 1928. 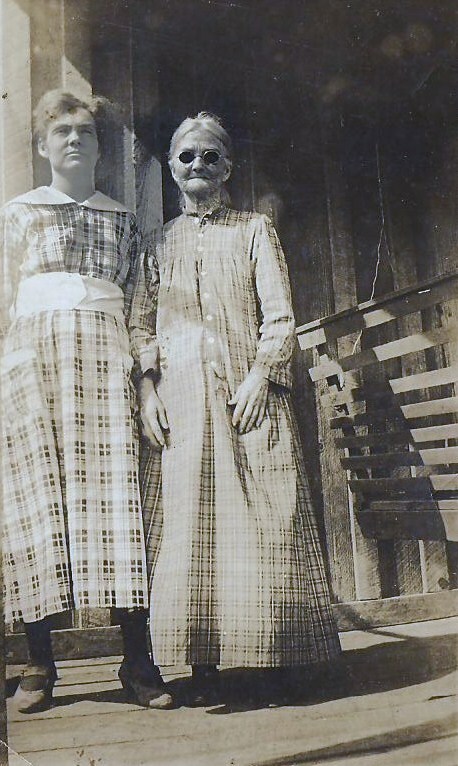 On March 15th, 1926, Zula's grandmother, Martha Elizabeth Dennis Nowell, succumbed to influenza at the age of 82. She died in the home of her son-in-law and daughter, J. Sam and Bettie F. Davis, in Chandler, and was buried at Rockhill Cemetery in Brownsboro. "Me, Grandma and Mama were sitting around her kitchen table as usual and somehow it came up. Grandma said it took place between Effie's birth and Winnie's. She thinks she was just a month or so pregnant...it wasnt officially verified by a doctor or anything. She said she was "late" and figured she must be pregnant again but within a few weeks "stuff" came out and she figured she miscarried." Almost a year after Winnie was born, Granddaddy's mother, Martha Fransina "Synie" Parmer died of heart failure in Chandler. About a year and a half later, Granddaddy's father, Green Clifton Parmer, also died, on August 1, 1929. Like most of the Parmers and Nowell's who died in Henderson County, they are also buried in Brownsboro's Rock Hill Cemetery. Maggie Lorraine and her husband, Otis Sanders, as you may recall, divorced around this time, or at least sometime between their daughter Elsie's birth and Otis's 1930 marriage to Allene Hancock. On October 24, 1929, the stock market crashed (Black Tuesday), sparking the beginning of the Great Depression. In November, around $30 billion in stock values simply vanished, while President Hoover announced that, "Any lack of confidence in the economic future or the basic strength of business in the United States is foolish." By March of 1930, the unemployment rate more than doubled from what it was prior to "Black Tuesday", to over 3 million. Meanwhile, in 1930, Grandma and Granddaddy were raising their daughters on a rented farm in part of Justice Precinct 4 in Henderson County. 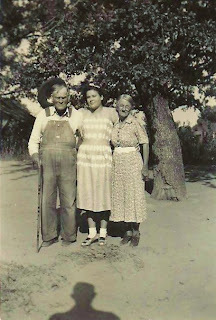 Grandma's siblings, George "Kit", Dora and Tommie were still at home with their parents and young niece, Oletha Wilson. #21935, Martha E Nowell, Confederate pension applications, Texas Comptroller's Office claims records, Archives and Information Services Division, Texas State Library and Archives Commission. (https://familysearch.org/pal:/MM9.1.1/JXQQ-39D : accessed 08 Feb 2013), Francis Sina Parmer, 03 Jan 1928; citing reference certificate # 2600, State Registrar Office, Austin, Texas. Gina asked me the other day if these stories would be preserved with the family tree. That reminded me of a post on the FHWC forum I had read about an hour earlier asking what happens to all of our family history blog posts if we die, and no one is paying the hosting bill? Well, I'm 36, and in relatively good health, but accidents can happen. So this morning I printed out all of my blog posts about Grandma, slapped them into a folder, and labeled it "15 Zula Irene Nowell". I would have thrown Parmer onto the end of her name, but I wrote too large on the tab to fit it. In a little while I will put her folder, and all of my other genealogy research folders, including my pencil and paper ancestor charts, into the filing cabinet. So if I get hit by a meteorite the size of a refrigerator, Family, you know where to find it. There's also a bunch more on my netbook, so somebody can copy all of that stuff and distribute it to whoever wants it in the Martin, Parmer, Norman and Russell lines, if they are so inclined. I'll work on getting more stuff printed out as I go. And I really need to invest in a backup drive. Of course, neither of those is likely to survive if the house burns down, but there are others with the same research data I have (probably more than I have). I have to draw the line somewhere between hobby and obsession. So, hopefully I will live long enough to get all of this organized into something distributable for the family. But if I don't, you know where to find it. There is no story today because we are leaving town in a few hours. But I didn't want to just skip a day, since the point of this Family History Writing Challenge is to write consistently, every day, for 28 days. So I just made my 300 word quota for the day ;-D Okay, it's supposed to be about somebody, so I'll take a notebook in the car and jot something down to post tomorrow. It was 1923 or 1924 when Grandma's family moved to Henderson County from Lawn, Tx. 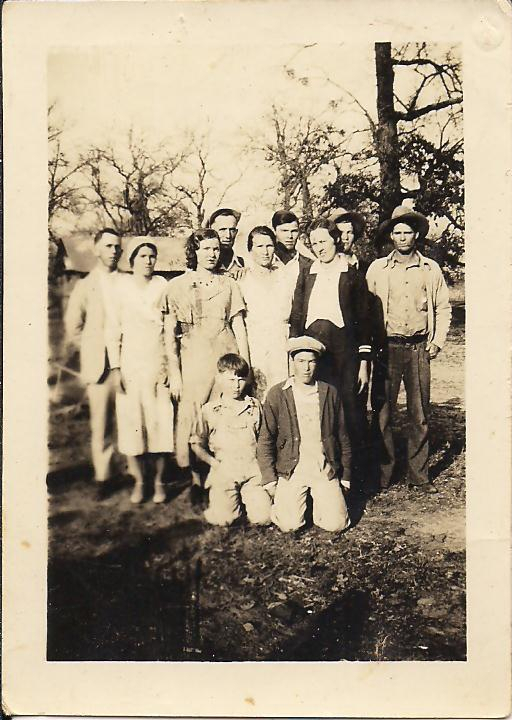 Grandma was about 20 years old, and she and her brothers, Kit and Tommie, sister Dora, and baby niece Oletha were all living with George and Rebecca. This is where Grandma met the love of her life. Rufus Amery Parmer, better known as Jack, was born and raised on a farm in Henderson County, Texas. He came from a large family, who had migrated to Texas from Barbour County, Alabama in the 1850s and 1860s. According to oral family history, his great-grandmother, Mary Ledbetter Tindel, wife of John Tindel (or Tindell), was full blood Indian. April has researched this claim extensively, and surely knows more of the facts behind this legend. John and Mary Tindel played a huge role in the development of the Henderson County town of Fincastle, and established the first school there. But by the time Granddaddy was born, the town began to dwindle when the railroad tracks were laid through other towns in the county. John and Mary's daughter Lydia Frances Tindel married Jacob Henry Parmer in the late 1840s, probably in Barbour County, Alabama where their first 6 children were born. 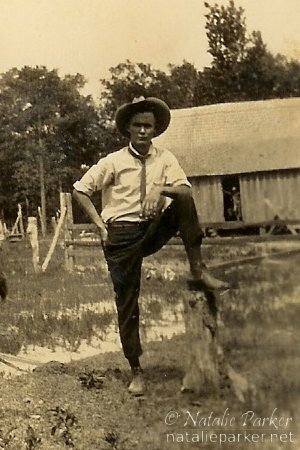 Jacob Henry Parmer was the son of Benjamin Parmer Sr., a Georgia native who had migrated near Creek Indian territory in Pike County, Alabama in the 1820s (the area was formed into Barbour County in 1832). 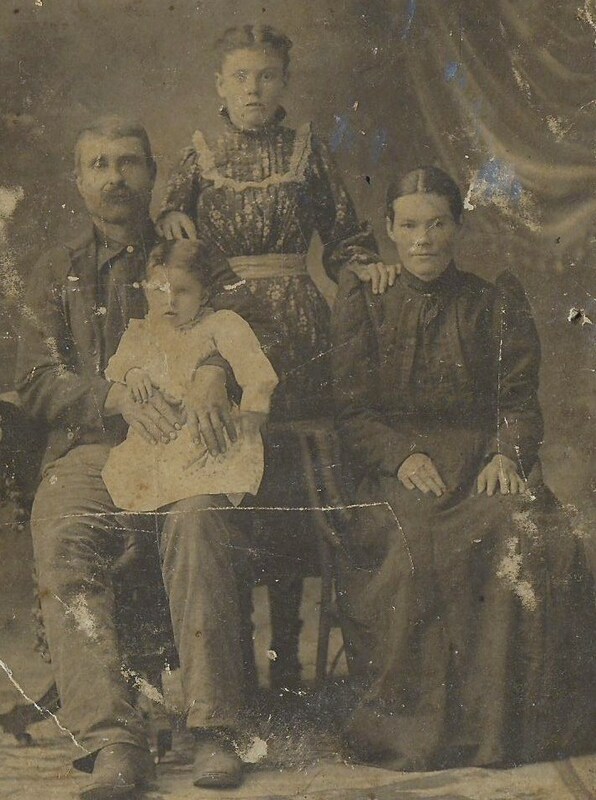 Granddaddy's mother, Martha Fransina "Synie" Greer, was born in Henderson County on May 17, 1866, to Civil war veteran John Alford Grier and Martha Elizabeth Perkins Crumpler Grier. Four years after burying Jacob Parmer in the Fincastle Cemetery, Synie and Green were married on November 20, 1884 at "Home" according to the marriage page from Synie's bible. They had seven children: Henry Alford, Nora Elinor, Lyta Pearl, Nathan Napolean, George Browning, Rufus Amery, and Joe Matterson. Granddaddy was a twin, born December 17, 1901, two years after the death of his grandmother, Lydia. 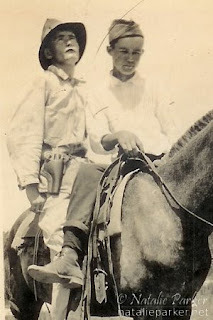 Jack and Joe Parmer were the youngest of Green and Synie's nine childen. Granddaddy might have been born first if the order in which Synie listed their names in her bible is any indication of their birth order. Jack (front) and Joe (back). I remember Granddaddy telling my sister and I about his school days, though I don't remember any specifics, just that he said he got in trouble a lot. 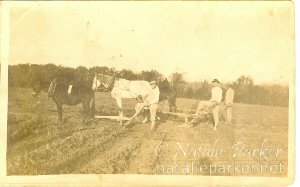 The Nowell family may have rented a farm neighboring Granddaddy's brother, Nathan's farm. The census taker visited George Nowell's household immediately after Nathan Parmer's in 1930, anyway. 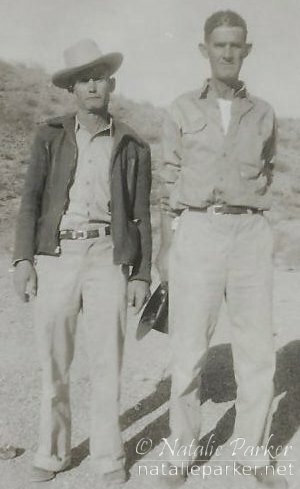 Granddaddy and Grandma's brother, Kit, were about the same age, and probably became good friends. As the story goes, Granddaddy had been out hunting with Grandma's brother, and when they returned, upon seeing Grandma, he told Grandma's brother that he was going to marry her. Now, I've already mentioned how Grandma knew she was going to marry Granddaddy in "Grandma was a witch". And she was right. 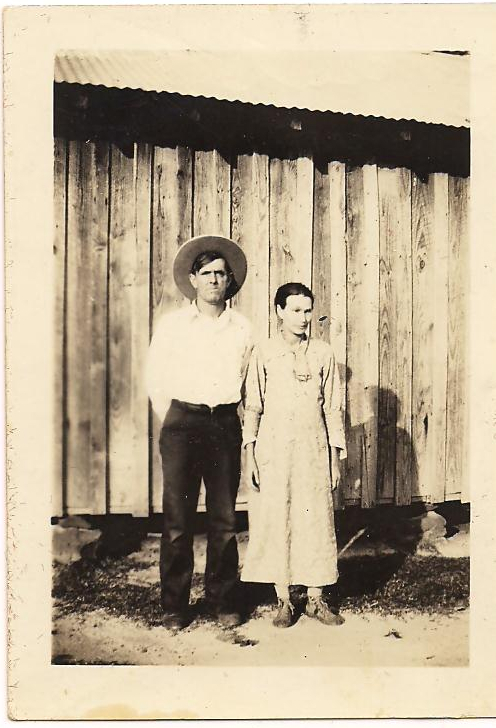 They were married on September 16, 1924, supposedly in Tyler, Smith County, Texas. I couldn't find their names in the marriage book at the library. Either it was misread by the transcriber (happens a LOT with these two), or maybe they got married somewhere else. Again, anyone related to or researching this line, I'd be happy to share the full size, unaltered scanned images of these photos and documents. Just let me know what you need in the comments. 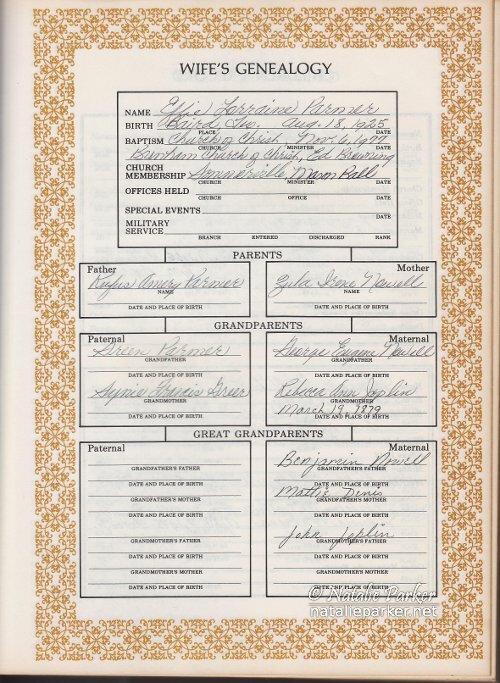 Lydia's bible, family records page, scans received from Gary Wright. Synie's bible, family records and marriages pages, scanned images received from Gary Wright. 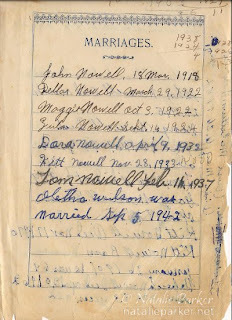 Grandma's bible, marriages page, scanned images received from Gina. 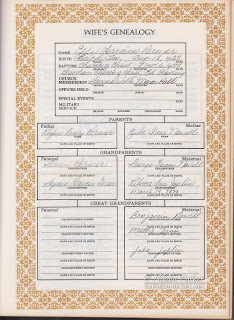 Effie's bible, wife's genealogy page, scanned images. Conversations with Gina, Nancy, Donna and April. Kathryn Brown, "FINCASTLE, TX," Handbook of Texas Online (http://www.tshaonline.org/handbook/online/articles/hrf10), accessed February 08, 2013. Published by the Texas State Historical Association. Linda Sybert Hudson, "HENDERSON COUNTY," Handbook of Texas Online (http://www.tshaonline.org/handbook/online/articles/hch13), accessed February 08, 2013. Published by the Texas State Historical Association. "The Palmers and Parmers of North Carolina, Alabama and Mississippi" by John T. Palmer, pgs 12-18, scanned pages received from Gary Wright. "United States Census, 1860," index, FamilySearch (https://familysearch.org/pal:/MM9.1.1/MHDH-CVK : accessed 08 Feb 2013), Jacob H Parmer, , Barbour, Alabama; citing p. 167, family 1309; NARA microfilm publication M653, FHL microfilm 803001. "United States Census, 1870," index and images, FamilySearch (https://familysearch.org/pal:/MM9.1.1/MXLB-PR2 : accessed 08 Feb 2013), Green C Parmer in household of Jacob H Parmer, Texas, United States; citing p. 7, family 38, NARA microfilm publication M593, FHL microfilm 0553090. "United States Census, 1870," index and images, FamilySearch (https://familysearch.org/pal:/MM9.1.1/MXLB-R3M : accessed 08 Feb 2013), John A Grear in household of John A Grear, Texas, United States; citing p. 32, family 229, NARA microfilm publication M593, FHL microfilm 0553090. "United States Census, 1880," index and images, FamilySearch (https://familysearch.org/pal:/MM9.1.1/MFNV-1J9 : accessed 08 Feb 2013), Jacob N Parner, Fincastle, Henderson, Texas, United States; citing sheet 184B, family 0, NARA microfilm publication T9-1310. "United States Census, 1900," index and images, FamilySearch (https://familysearch.org/pal:/MM9.1.1/M3GP-L32 : accessed 08 Feb 2013), Green C Parmer, ED 60 Justice Precinct 5, Henderson, Texas, United States; citing sheet 11B, family 197, NARA microfilm publication T623, FHL microfilm 1241644. 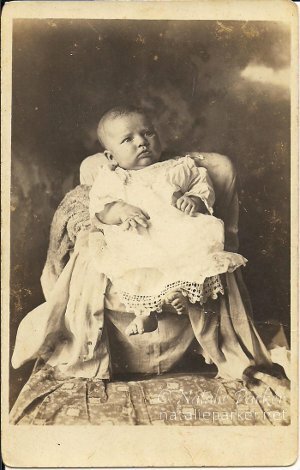 "Texas, Births and Christenings, 1840-1981," index, FamilySearch (https://familysearch.org/pal:/MM9.1.1/F6G2-PR2 : accessed 08 Feb 2013), Rufus Amery Parmer, 17 Dec 1901. "United States Census, 1910," index and images, FamilySearch (https://familysearch.org/pal:/MM9.1.1/MK1L-WJT : accessed 08 Feb 2013), Green C Parmer, Justice Precinct 5, Henderson, Texas; citing sheet 6A, family 102, NARA microfilm publication T624, FHL microfilm 1375576. "United States Census, 1920," index and images, FamilySearch (https://familysearch.org/pal:/MM9.1.1/MHYC-8Z9 : accessed 08 Feb 2013), Green C Parmer, , Henderson, Texas; citing enumeration district (ED) , sheet 21B, family 447, NARA microfilm publication T625, FHL microfilm 1821818. "Texas, Deaths, 1890-1976," index and images, FamilySearch (https://familysearch.org/pal:/MM9.1.1/JXQQ-39D : accessed 08 Feb 2013), Francis Sina Parmer, 03 Jan 1928; citing reference certificate # 2600, State Registrar Office, Austin, Texas. I got one started on Grandma and Granddaddy, but I don't think I will be able to finish it tonight. Too many distractions throughout the day, and got a late start. Plus, my eyes aren't used to being on the computer this long anymore. It'll get easier though. And I'm looking forward to getting all that I know about Grandma (and suspect) written. Then organizing my research, and writing about another ancestor. This is a lot more fun than I expected. But it's difficult when you're trying to take care of nine other things at once. Granddaddy inventing the Capt. Morgan pose. Sorry guys. I'll try to do better tomorrow. 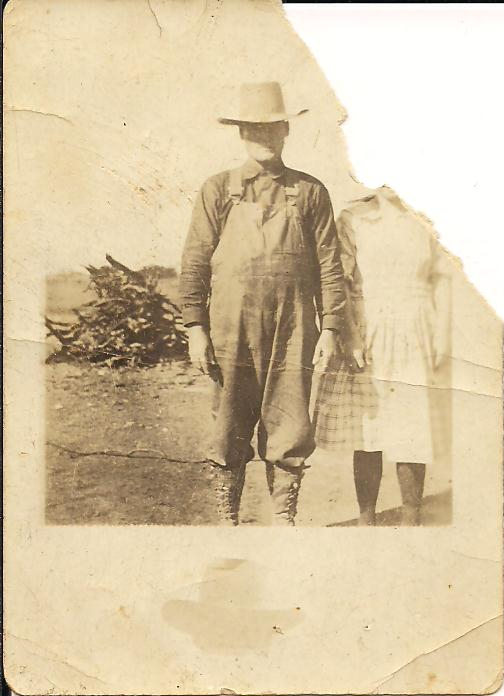 But I'll leave you with this really awesome picture of Granddaddy, circa 1920-ish, that cousin Gary Wright sent me years ago when I first started researching. I love this one. If anyone related wants the original, unaltered scan, just drop me a note in the comments and I'll send it to the email address you comment with. Maggie Lorraine Nowell was one of our more infamous family members. I've written about her before in a Wedding Wednesday post. Born October 7, 1906, Maggie Lorraine was closest in age to Grandma than any of her other sisters, so I would imagine they were pretty tight. Let's return back to the Fall of 1922 in Taylor County, Texas. The Nowell family has probably harvested this year's crop of cotton, or are close to finishing up. Newly-wed Della is expecting, and is likely certain she knows the gender of the child, having used the "magic" pendulum. And Maggie Lorraine is in love. Or something like that. The family of Otis Sanders had been living and farming in Taylor by 1900. Otis was seven years older than Maggie, who was soon to turn sixteen when they married on October 3, 1922. Eight months later, on June 14, 1923, Maggie Lorraine gave birth to her first child, Lorena Sanders. Eight months? Actually, about 36.3 weeks from the date Maggie and Otis married. Now it could be that Lorena was born a little early. Or it could be that Maggie Lorraine, whether she knew it yet or not, was already pregnant. I can just hear Grandma scoffing out a, "Good Lord." Either way, there was another new baby in the family to bring a little bit of joy after mourning the loss of their big sister Della. Maggie Lorraine's daughter was buried in Rogers Cemetery in Tuscola, the same cemetery Della was buried in the previous year. I can't be sure what prompted George and Rebecca to make the nearly 300 mile trek to settle down in Henderson County, Tx. George's mother was 80 years old, not in great health, and still living with Sam and Bettie Davis in Henderson County. His brother, Johnny R, was buried in Brownsboro's Rock Hill Cemetery in 1923. And his uncle, Robert Adolphus Nowell, had died there back in 1920. Perhaps they just wanted to live closer to the remaining Nowell family. Or maybe, despite the fact that overall cotton production was going well in Taylor County, George had reason to think they would fare better in Henderson County. At this point I can only speculate. Whatever the reason, George, Rebecca, Kit, Zula, Dora, and Tommie moved to Henderson County sometime between Maggie's October 1923 marriage to Otis, and Grandma's September 1924 marriage to Granddaddy. I don't know if Otis and Maggie went with them, or remained in Taylor County. All I have on little Elsie Sanders is a photograph, and two censuses. She was born about 1925, and was 5 years old at the time she was enumerated on the 1930 U.S. Census for Taylor County on April 11 of that year. She was living in the household of Otis Sanders with Otis's widowed mother, Maggie Mitchell Sanders, and Otis's wife, Allene. Where did Maggie Lorraine go? The thing is, on that 1930 census, Otis has just remarried. His new wife is a seventeen-year-old local girl by the name of Allene A. Hancock. Well, Allene Hancock Sanders, now. So, what? Does he just have a thing for teenage girls? Nope. Otis was married to Allene for 34 years until he died in 1964. They had kids. Grandkids. Great-grandkids. You can read all about it at Find a Grave. 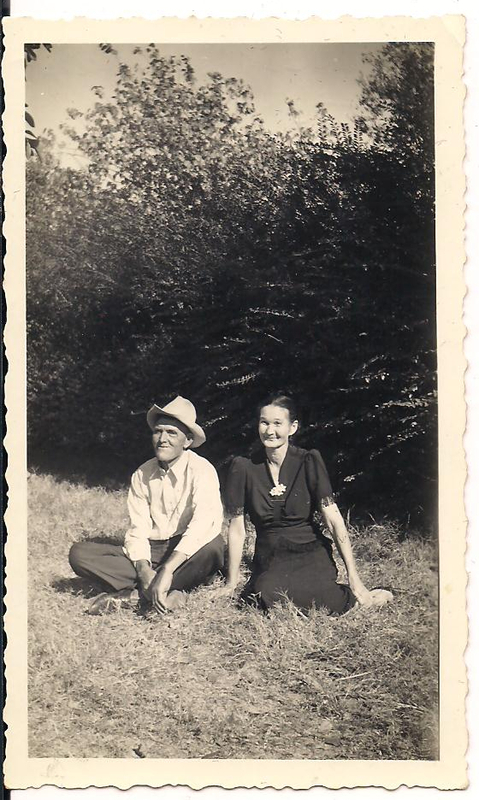 Otis and Allene are also enumerated on the 1930 census in Henderson County on April 23rd. They were living in the dwelling of Sidney C Leavell (haven't had time to look for a connection to that one), and apparently paying rent to him. Now, this isn't the first time I've seen someone's name pop up twice in the same census year, but it is the first time I've seen it happen 300 miles away. Granted, there are possible explanations. According to Allene's bio on Find A Grave, Otis and Allene married in Louisiana in 1930, but I haven't been able to find a specific date or location. Perhaps they are on their way to or back from Louisiana while Otis's mom watches over Elsie, renting a room for a night or two before continuing on. Just a coincidence that he's in the same Justice Precinct of Henderson County as his ex-wife's family? Or, perhaps Maggie had gone to live with her family in Henderson County, and there was some matter Otis needed to clear up. But Maggie Lorraine isn't living with her parents on the 1930 census. Nor is she living with her brother, John. Or Aunt Bettie. She doesn't appear to be in Taylor County, either. I know she's alive, there's a lot more to her story. Maybe she's remarried, too? Maybe he was there looking for his ex-wife and couldn't find her? I have no idea. Much more digging to do here. 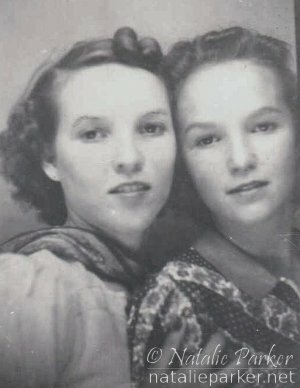 April 3rd, 1940 Elsie Sanders is living with her grandmother, Maggie Mitchell Sanders. There are no street names or house numbers recorded for this area, just the order of visitation and family numbers. The census taker visited the household of Otis Sanders just before stopping by his mother's place. Otis, Allene, and their three children are living in a rented house for $5 a month. He had been seeking work, and finally landed a job as a floor manager at a dance hall. His mother is 67, owns her house, and is receiving an income from some other source than wages or salary. Elsie is 15, and attending school after having completed her second year of high school. I know no more about her. Aside from an undated photo of a George Gough with "one of Lorraine's husbands" written on it, Grandma's sister Maggie Lorraine Nowell has fallen off my radar until 1948. Side note: If any descendants or relatives of Elsie Sanders happen across this, please leave a note in the comments (my contact form went screwy and I haven't had a chance to fix it). 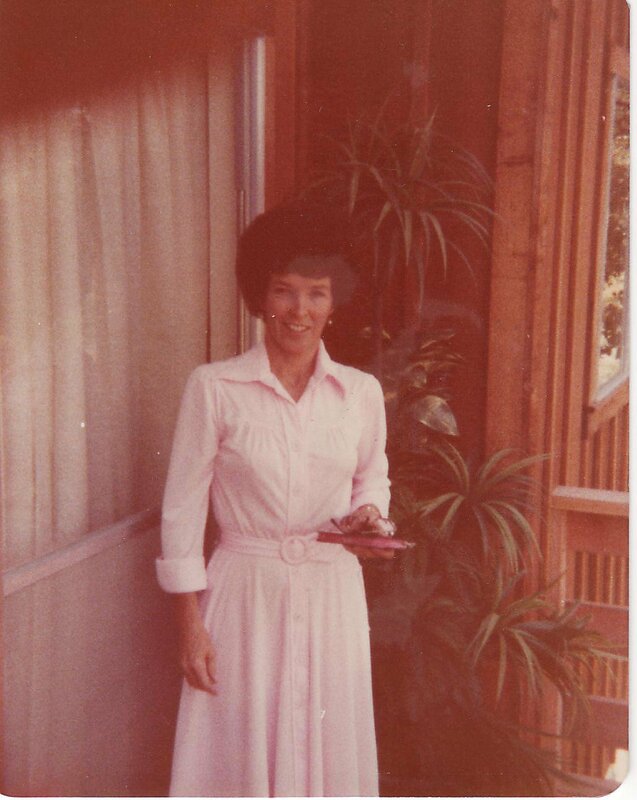 I'd be happy to pass along the full size original scans of the family photos. I'd also be interested to learn what became of Elsie. "United States Census, 1900," index and images, FamilySearch (https://familysearch.org/pal:/MM9.1.1/M356-XNG : accessed 06 Feb 2013), William A Sanders, ED 152 Justice Precincts 3 & 6, Taylor, Texas, United States; citing sheet 8A, family 131, NARA microfilm publication T623, FHL microfilm 1241672. "United States Census, 1930," images, HeritageQuest Online (http://0-www.heritagequestonline.com.catalog.houstonlibrary.org/dvimage/genealogy/stage/dvimage?filename=/heritage/vault/hqc14/T626/2355/1/102A.tif&invert=0&scale=2&mimeType=application/pdf : accessed 06 Feb 2013), Otis R. Sanders, 5 J-PCT (South Part), Henderson, Texas, United States; Series T626, Roll 2355, Page 102A. "Texas, Deaths (New Index, New Images), 1890-1976," index and images, FamilySearch (https://familysearch.org/pal:/MM9.1.1/K3XV-QZK : accessed 06 Feb 2013), Otis R Sanders, 1964; citing State Registrar Office, Austin, Texas. "United States Census, 1930," index and images, FamilySearch (https://familysearch.org/pal:/MM9.1.1/CM7M-RW2 : accessed 06 Feb 2013), George W Nowell, Precinct 5, Henderson, Texas; citing enumeration district (ED) 0019, sheet 3B, family 60, NARA microfilm publication T626, roll 2355. "United States Census, 1940," index and images, FamilySearch (https://familysearch.org/pal:/MM9.1.1/K43G-V84 : accessed 06 Feb 2013), Elsie Sanders in household of Maggie Sanders, Lawn, Justice Precinct 6, Taylor, Texas, United States; citing enumeration district (ED) 221-32, sheet 2A, family 25, NARA digital publication T627, roll 4144. There's probably a few more, but I'm so tired. If you need to know where I found some bit of information, leave a comment and I'll let you know. Cotton farmers had struggled with drought conditions in Taylor county throughout the 1910s, but the 1920s brought a resurgence in cotton farming to the area. This is where we find the Grandma's family in 1922, about 25 miles south of Abilene in the tiny rural community of Lawn. The Santa Fe Railroad laid tracks in 1909, but the small town of Lawn wasn't close enough to benefit. The community couldn't bring the rails to Lawn, so in 1910 they took Lawn to the rails, leaving behind what is now called Old Lawn. The newly re-established town of Lawn enjoyed a fair amount of growth over the next two decades, with a peak population of 650 residents in 1929. 1922 was a good year for Taylor County cotton farmers. The number of bales ginned rose by over 8,000 from the previous year, to 30,385. 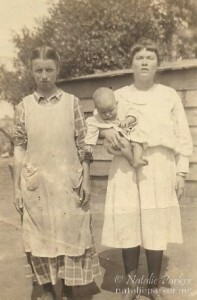 Zula, Maggie Lorraine and Dora were attending school in Lawn, Tx during the 1921-1922 school year. Grandma was 18 years old, and in the sixth grade. Della Nowell, the eldest of George and Rebecca's children, was 26 in the Spring of 1922. She married a fellow called Bird Wilson on March 22nd, 1922. By the time the cotton was planted, Della was pregnant. Maggie Lorraine also married in October the same year, but we will get to that story tomorrow. On February 9, 1923, Della gave birth to Oletha Wilson. But Della soon fell ill. She was suffering from an infection commonly referred to as childbed fever. Childbed fever, or puerperal fever, according to the Encyclopedia Britanicca, could develop "... after long and injurious labour and unskilled instrumental delivery..."
Della Wilson's death certificate states that she succumbed to "Flu and Child Bed Fever" on March 4, 1923 at the age of 27. She was buried March 6th at Rogers Cemetery, in Tuscola about 8 miles northeast of Lawn. Whatever became of Della's husband is still a mystery to me. Rebecca and George took Oletha in. Grandma had just turned 19 the previous November. After losing her baby brother nearly six years earlier, she had a new baby in her life. But now her oldest sister was gone. And there would be more joy and heartbreak for the Nowell family in the year to come. - No longer active, but have the text saved. Zula, Maggie and Dora Nowell listed as students. The Texas Almanac and State Industrial Guide 1925, Book, ca. 1925; digital images, (http://texashistory.unt.edu/ark:/67531/metapth123783/ : accessed February 05, 2013), Page 224, University of North Texas Libraries, The Portal to Texas History, http://texashistory.unt.edu; crediting Texas State Historical Association, Denton, Texas. "Texas, Deaths, 1890-1976," index and images, FamilySearch (https://familysearch.org/pal:/MM9.1.1/JDXR-CJT : accessed 04 Feb 2013), Dello Wilson, 04 Mar 1923; citing reference 10269, State Registrar Office, Austin, Texas. "Texas, Deaths, 1890-1976," index and images, FamilySearch (https://familysearch.org/pal:/MM9.1.1/J6SJ-TPV : accessed 04 Feb 2013), Oletha Walker, 27 Mar 1975; citing reference 24988, State Registrar Office, Austin, Texas. Mom once asked Grandma how long it took to travel by covered wagon. My mom was working on a historical romance novel, and Grandma was a great source of information for how things were in the "old days". Grandma said they could cover about 25 miles a day. As previously mentioned, boll weevils drove many of the cotton farmers out of Comanche County in search of more conducive land. The next time Grandma's family pops up on the US census is in Hunt County, about 200 miles Northeast. But something terrible happened along the way. On October 7, 1917, Grandma's one-year-old baby brother, J.D., had to see a doctor in Mansfield, Tarrant County, Texas, just outside of Fort Worth. But to no avail. A week later, on the 15th, J.D. died of "bowel trouble with brain complications". He was buried the following day in Pleasant Valley Cemetery in Mansfield (that cemetery is now located in Cedar Hill, Dallas County). Granny Rebecca was the informant for the death certificate. Well, actually, there are two death certificates for J.D., 29418 and 29415. 29418 does not have burial information, whereas 29415 does. 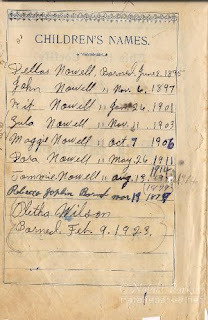 And I found them quite by accident because the name is spelled Norwell instead of Nowell on both documents. From these two death certificates we learn that J.D. was 1 year, 1 month, and 16 days old, born on 30 Aug 1916 in Comanche County, Texas, that he was breast-fed, and he first saw the doctor that signed his death certificates (I can't make out his name) 8 days before his death. It is also stated that his father, George Nowell (okay, Norwell on the document) was born in Delta County, Texas, and his mother, Rebecca Joplin, was born in Nashville, Tennessee. These two death certificates are the only evidence I have that J.D. Nowell ever even existed. I don't remember Grandma ever mentioning him, and he isn't recorded in the family bible. The primary cash crop of Hunt County at the time was cotton, and this may well be what drew George and Rebecca Nowell to take a chance there, despite the fact that the rest of George's family headed to Murchison in Henderson County. George's widowed mother, Mattie, lived with her youngest daughter, Bettie, and Bettie's husband, John S. Davis. George's brother John R., and oldest son John Benjamin, had also moved their families to Henderson County by 1920. Though cotton production was at its peak in Hunt County, the majority of farmers weren't really turning a profit. This was mainly due to the fact that many of them rented the farms they worked on. George, Della, Kit, Grandma, and Maggie Lorraine all worked for wages as farm laborers. In addition, 16-year-old Grandma, 14-year-old Maggie, and 8-year-old Dora were also attending school. But it wasn't long before the Nowell family packed up their belongings and hit the road again. This time they would travel 250 miles west, where adventure and more tragedy awaited. 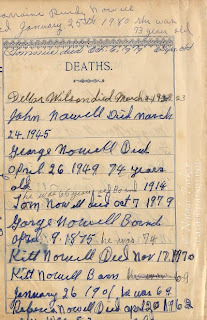 "Texas, Deaths, 1890-1976," index and images, FamilySearch (https://familysearch.org/pal:/MM9.1.1/JD6S-R8H : accessed 04 Feb 2013), J. D. Norwell, 15 Oct 1917; citing reference cn 29418, State Registrar Office, Austin, Texas. 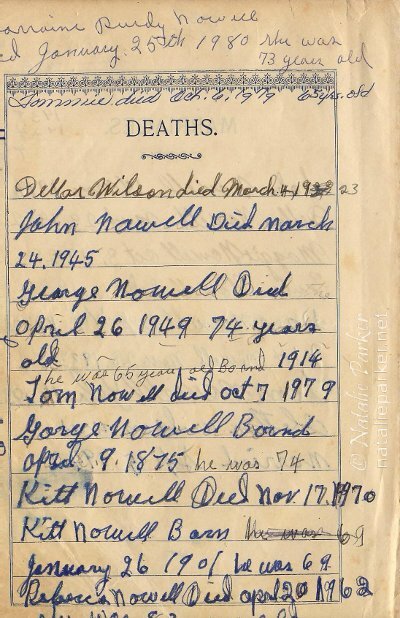 "Texas, Deaths, 1890-1976," index and images, FamilySearch (https://familysearch.org/pal:/MM9.1.1/JD6S-RZ1 : accessed 03 Feb 2013), J. D. Norwell, 15 Oct 1917; citing reference cn 29415, State Registrar Office, Austin, Texas. "United States Census, 1920," images, HeritageQuest Online (http://0-www.heritagequestonline.com.catalog.houstonlibrary.org/dvimage/genealogy/stage/dvimage?filename=/heritage/vault/hqc29/T625/1820/2/116A.tif&invert=0&scale=2&mimeType=application/pdf), G E Nowell, 6-PCT (part), Hunt, Texas, United States; citing ED 140, Dwelling 206, Family number 210, Series T625, Roll 1820, Page 166. "United States Census, 1920," images, HeritageQuest Online (http://0-www.heritagequestonline.com.catalog.houstonlibrary.org/dvimage/genealogy/stage/dvimage?filename=/heritage/vault/hqc28/T625/1818/1/156A.tif&invert=0&scale=2&mimeType=application/pdf), John Nowell, Murchison, Henderson, Texas, United States; citing ED 21, Sheet 7A, Dwelling 121, Family number 122, Series T625, Roll 1818, Page 156. "United States Census, 1920," images, HeritageQuest Online (http://0-www.heritagequestonline.com.catalog.houstonlibrary.org/dvimage/genealogy/stage/dvimage?filename=/heritage/vault/hqc28/T625/1818/1/187C.tif&invert=0&scale=2&mimeType=application/pdf), John B. Nowell, Murchison, Henderson, Texas, United States; citing ED 21, Sheet 17A, Dwelling 334, Family number 345, Series T625, Roll 1818, Page 187. "United States Census, 1920," images, HeritageQuest Online (http://0-www.heritagequestonline.com.catalog.houstonlibrary.org/dvimage/genealogy/stage/dvimage?filename=/heritage/vault/hqc28/T625/1818/1/187B.tif&invert=0&scale=2&mimeType=application/pdf), John S. Davis, Murchison, Henderson, Texas, United States; citing ED 22, Sheet 16B, Dwelling 324, Family number 335, Series T625, Roll 1818, Page 187. 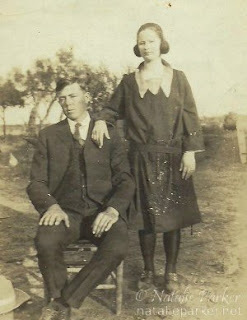 Grandma's parents were married in Hillsboro, Tx in the summer of 1894. George and Rebecca probably met in Johnson County after her father, John M. Joplin, moved his second wife and children there from Tennessee sometime before 1900. George's parents and maternal grandparents had been living in Johnson County by 1880, having previously made a go of it in Lamar County after his parents married. George and Rebecca had both grown up on farms, and they continued with what they knew. 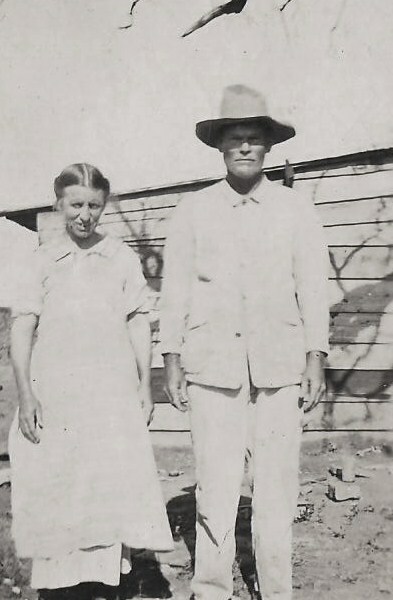 Along with George's parents Ben and Mattie, older brother John R.'s family, and little sister Bettie Frances, George and Rebecca headed about 100 miles west to rent a farm in Comanche County. The economy in Comanche County was booming for farmers and ranchers between 1890 and 1900, and the rapid population growth reflected that. Cotton farming in the area increased dramatically from a single bale produced in 1860, to over 24,000 commercial bales in 1900. Comanche County was the place to be. The Nowells established a cotton farm, worked hard, and raised their family. I can't say for sure whether their first two children, Della and John Benjamin, were born before or after they arrived in Comanche County. 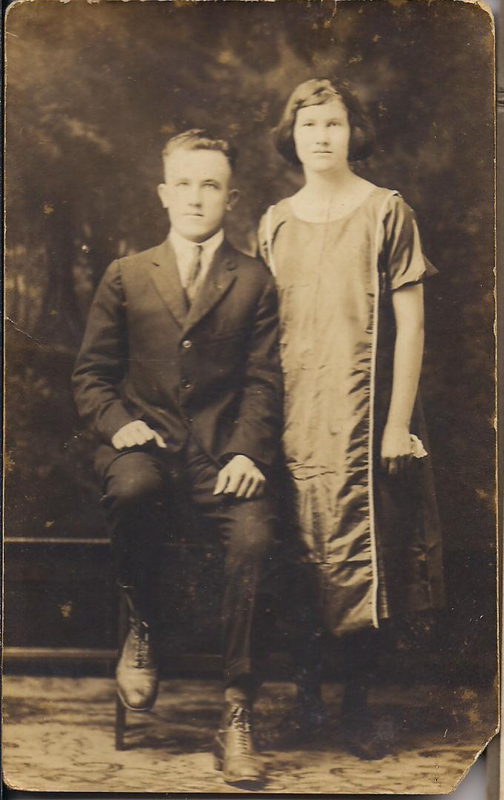 Della was born 2 Jun 1895, and John B. was born 6 Nov 1897. But they were definitely living on a Comanche County farm by 1900, where the rest of their children were certainly born. 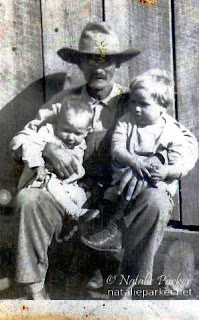 George Columbus "Kit" Nowell came along on the 26th of January, 1901, followed by Grandma Zula Irene on November 11, 1903. 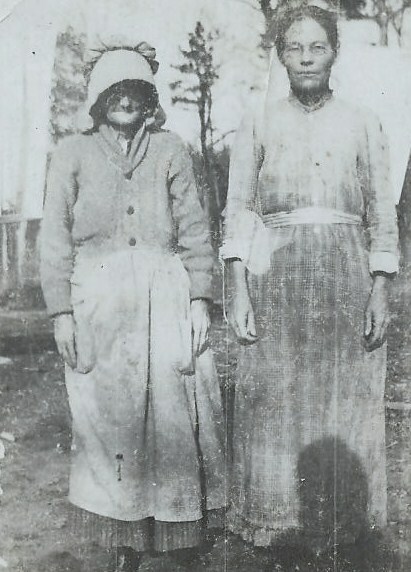 Maggie Lorraine and Dora were born in 1906 and 1911, respectively. George's father's health was declining by then. Joseph Benton Nowell was receiving a small pension for his service in the civil war, but he was no longer able to work. On the 5th of July, 1913, Ben Nowell passed away at the age of 69 or 70 (born 1842 or 1843), when Grandma was 9 years old. 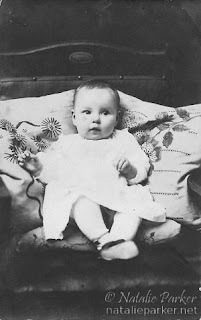 George and Rebecca had two more children, Tommie born August 13, 1914, and J.D. born on the 30th of August in 1916. However, things weren't going as well as they had hoped. The Nowell's, like most of the cotton farmers in Comanche County, were struggling. Cotton crops were being destroyed by an infestation of boll weevils, leaving farmers in the area with nothing to show for their hard work. As Grandma would say, they didn't have a pot to piss in, or a window to throw it out of. It was time to get out of Comanche County and try their luck elsewhere. ), George Nowell, 5-PCT, Johnson, Texas, United States; Series T9, Roll 1313, Page 366. "United States Census, 1900," index and images, FamilySearch (https://familysearch.org/pal:/MM9.1.1/M3LW-M48 : accessed 03 Feb 2013), George Nowell, ED 26 Justice Precinct 1 (west half), Comanche, Texas, United States; citing sheet 11B, family 198, NARA microfilm publication T623, FHL microfilm 1241622. "United States Census, 1900," index and images, FamilySearch (https://familysearch.org/pal:/MM9.1.1/M3L7-XGY : accessed 03 Feb 2013), Joseph B Nowell, ED 27 Justice Precinct 1 (east half), Comanche, Texas, United States; citing sheet 18A, family 322, NARA microfilm publication T623, FHL microfilm 1241622. "United States Census, 1900," index and images, FamilySearch (https://familysearch.org/pal:/MM9.1.1/M3L7-LCR : accessed 03 Feb 2013), John R Nowell, ED 26 Justice Precinct 1 (west half), Comanche, Texas, United States; citing sheet 11A, family 194, NARA microfilm publication T623, FHL microfilm 1241622. "United States Census, 1910," index and images, FamilySearch (https://familysearch.org/pal:/MM9.1.1/MK15-83L : accessed 03 Feb 2013), George N Nowell, Justice Precinct 2, Comanche, Texas; citing sheet 15B, family 299, NARA microfilm publication T624, FHL microfilm 1375554. "United States Census, 1910," index and images, FamilySearch (https://familysearch.org/pal:/MM9.1.1/MK15-VRG : accessed 03 Feb 2013), Ben Nowell, Comanche, Comanche, Texas; citing sheet 8A, family 123, NARA microfilm publication T624, FHL microfilm 1375554. "United States Census, 1910," index and images, FamilySearch (https://familysearch.org/pal:/MM9.1.1/MK1P-PMS : accessed 03 Feb 2013), John R Nowell, Comanche, Comanche, Texas; citing sheet 19A, family 331, NARA microfilm publication T624, FHL microfilm 1375554. "United States Census, 1880," index and images, FamilySearch (https://familysearch.org/pal:/MM9.1.1/MD7F-CCG : accessed 03 Feb 2013), J. M. Joplin, District 8, Henderson, Tennessee, United States; citing sheet 289B, family 0, NARA microfilm publication T9-1262. "United States Census, 1900," index and images, FamilySearch (https://familysearch.org/pal:/MM9.1.1/M3PS-5MK : accessed 03 Feb 2013), John M Joplin, ED 54 Justice Precinct 1 (southeast part), Johnson, Texas, United States; citing sheet 20B, family 350, NARA microfilm publication T623, FHL microfilm 1241649.